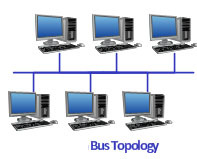 Bus Topology is the simplest network topology type where every computer and network device is connected to single cable called bus by using interface connectors. Every system (Computer, Server, Devices) communicate with another device with the help of this bus and so this central cable which is known by bus is the Backbone of the network. It Transmits data in one direction. Every device connected to a single cable. Effectively used in small network place. Expansion is easy in this type of Network. Cable can have a limited length. If cable fails, the whole network will fail. Security issues are there in this network topology.